Caroline and Marisa met in 2007 at an Ascending Angels Healing workshop. At this time Caroline was working with the inspirational Donna Swan and was facilitating many workshops and events. Marisa felt inspired by the work that Caroline and Donna were sharing and felt empowered to learn more about Reiki and energy healing. Marisa noticed how both Donna and Caroline were teaching a very simple and easy experience of Reiki and Natural Healing energy. She realised that as mums they were incorporating healing energy into the family unit and creating a more conscious parenting experience for themselves. Marisa supported both Donna and Caroline in establishing Reiki Babies and was an intrinsic part of its creation. 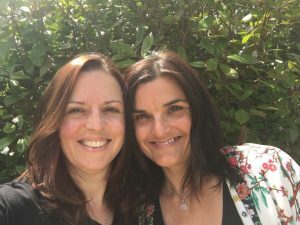 Marisa and Caroline now work together to share knowledge, to nurture, support and empower mums to explore mindful techniques and natural healing energy to develop their own conscious parenting experience. Both Caroline and Marisa are available for private treatments as well as a variety of workshops and classes. Please check our diary of events for more information.